A Pearl of Northern Gothic – this is the second name of the city. 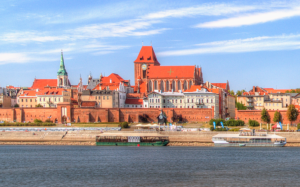 Though not as renowned as Krakow, Torun still equals it in terms of beauty and magic. An experienced guide will show you not only the most important monuments, but also all of the little details without which you would not feel the atmosphere of the city fully. Our Torun city walk includes the Old Town area, where you will have an opportunity to see the Town Hall, which is a superb monument of the Medieval burgher architecture of Europe. The next highlights are Artus Court, the Church of the Holy Spirit, Copernicus’ House, the Slanting Tower, the Bridge Gate, the Monument to Nicholas Copernicus, Under the Star House, St. Johns’ Cathedral, and the Copernicus House. If you visit Torun, don’t forget to taste some of its delicious gingerbread. We will help you become a Torun insider!